MANY OF US HAVE heard of the Tudors and Windsors of England, the Valois and Bourbons of France, the Habsburgs of Austria and Hungary, and the Radziwills and Czartoriskis of Poland. Right? Wrong! Well, at least partially wrong. The truth is that the Radziwills and Czartoriskis are not Polish at all. Neither are the Sapiehas, Pacs, Chodkiewiczes, Jagellons, Oginskis, Tyszkiewiczes, Ostrogiszkis, Sanguszkos and many other famous Lithuanian families that some historians would want us to believe they are. The only Polish thing here is the spelling of their names, which is how they are better known outside of Lithuania, nothing else. To put this situation into perspective, and to better understand the reasons for the confusion surrounding the origin of these and other Lithuanian families, let us look at Lithuania’s early history in a nutshell. Up until the late 1300s, Lithuania was a unified and sovereign country with no ties to any other. Its borders extended to the east and south, and encompassed many principalities and provinces populated by people of Slavic origin. Most of what today are the republics of Belarus and Ukraine, as well as parts of European Russia, where under the aile of Lithuanian kings. In 1386, King Jogaila accepted Christianity, married the Polish queen Jadvyga, and ascended the throne as king of both Lithuania and Poland. He left his cousin, Grand Duke Vytautas, to rule Lithuania on his behalf. Both countries became loosely tied by this act of marriage. At this time, Polish influence began to slowly but steadily seep into all aspects of Lithuanian life. By the middle of the l6th century, threatened by the increasing growth of Russia and pressure from the Polish nobility, Lithuania was forced to enter into a formal union with Poland. The union document, signed by officials of both countries in the city of Lublin in 1569, created the Lithuanian-Polish Commonwealth, which lasted until the end of the 18th century. Although this treaty united both countries politically, each reserved the right to keep its own independent army, treasury, code of laws, and internal governmental structures. Following the union, Polish influence in Lithuania intensified, and eventually came to dominate not only the political, but the social, economic, cultural and religious life as well. This was more apparent among the ambitious Lithuanian higher nobility, who in order to acquire political positions, lands and prestige in Poland, abandoned its native language, traditions and national identity in favor of Polish favors. Meanwhile the lesser nobility, small landowners and the peasantry, remained faithful to their Lithuanian roots. As was the case with noble families, in other countries, Lithuanian magnates made a special effort to many into other prestigious European families. Women married monarchs of other countries, and moved there. Men married daughters of kings and dukes, and brought them to Lithuania. As time passed, you would find Lithuanian noble blood among the most famous royal families of Eastern, Central and Western Europe. Many members of these families were also very active in foreign matters. They made a point to study at famous universities abroad. Some traveled extensively throughout Europe, the Middle East, even Africa and Asia. Others served as advisers or military commanders to foreign monarchs. Some were decorated for their services, and returned home with additional titles of nobility bestowed onto them by the German Emperor or the Pope. Separate branches of the same family would acquire real estate scattered throughout the entire Commonwealth, as far away as Ukraine, Volhynia, Podolia or White Ruthenia. When traveling from the Baltic to the Black Sea, the Radvilas (Radziwills) boasted that they always slept at home. Such vast lands and numerous residences were owned by this family! Vytautas the Great was the most famous ruler descended from the Gediminas family. With time, Polish influence, both in Lithuania and abroad, succeeded in eradicating the concept of national identity among the Lithuanian magnates. At home, they began to consider themselves to be Polish citizens from Lithuania, or Lithuanians from Poland. Abroad, Polish politicians and historians were doing their hardest to spread the notion that Lithuania was nothing more than a second-rate Polish province. And as such it began to appear in books and maps. It is interesting to note, that while the Lithuanian higher nobility spoke Polish, dressed like Poles, danced to Polish music and ate Polish dishes, a special kind of patriotism permeated their ranks. They did not care too much for their Polish counterparts, who considered all Lithuanians to be of a lower race. At the same time, they regarded the Polish nobles as rivals and usurpers. This rivalry extended into all walks of life, and sometimes led to bloody conflicts. Of course, the same type of rivalry and even armed confrontation existed among the Lithuanian families themselves, often resembling the famous Capulet and Montasgue family feud in Medieval Italy, popularized by the story of Romeo and Juliet. The conflicts between families in Lithuania and Poland became so frequent and violent, that they eventually led to the internal disintegration and foreign occupation o£ the Commonwealth by Austria, Prussia and Russia at the end of the 18th century. For centuries, the contribution of these families to the history and culture of Lithuania and Poland was enormous. Their members not only occupied positions of power and influence in state, provincial and local governments, the military, judicial and financial sectors, but the religious sector as well. They gave the Grand Duchy of Lithuania all its prime ministers, treasurers, senators, province governors (vaivadas), city mayors (castellans), cardinals and bishops. They also gave Lithuania some of its most renown military leaders (hetmans), who checked invasions by Germans, Russians, Swedes, Tartars, Cossacks and Turks. Some were pretenders to the throne. One member of the Radvilas family, Barbora (Barbara), b e ca m e G rand Duchess of Lithuania and Queen of Poland, and a member of the Cartoriskis family was elected king. The wealth and political power of these families often rivaled that of the monarch. At the same time, they were ardent promoters of the arts, sciences and literature, and built some of the most beautiful structures in the w orld, in clu d in g churches, convents, monasteries and palaces. Every family owned at least one, sometimes more, palaces in Vilnius, Capital o f the Grand Duchy. Each one was larger and more splendid than the other. To build and decorate them, they imported famous European architects, artist and artisans. Their art collections rivalled those in the West. Kings, Grand Dukes and princes were frequent visitors. 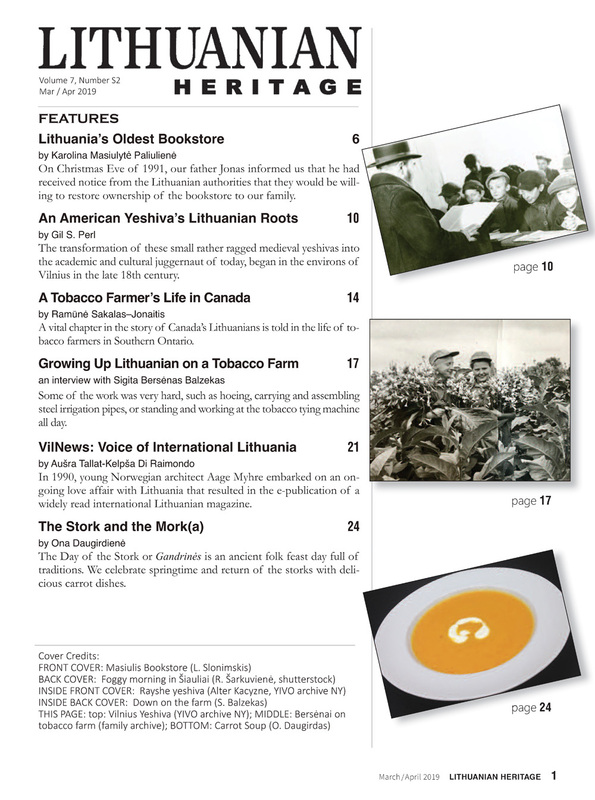 It would take a series of articles to describe all the great families of Lithuania, their fortunes and misfortunes, their accomplishments and contribution to the history of Lithuania – and we might just do that in future issues. But for now, let us take a look at some of the more important ones. The spelling of the family name is first given in Lithuanian, followed by the Polish spelling in parenthesis where appropriate. The Gediminas family is the most prestigious of all Lithuanian families. It gave Lithuania all of its rulers from the 13th to the 16th century, and Poland, from the 14th to the 16th. It also provided rulers to many Ukrainian, White Ruthenian and Russian provinces and principalities for many generations. Its patriarch, King Gediminas – who was described in our September- October issue – was a wise leader who is regarded the true creator o f the Lithuanian State and the founder of its capital city, Vilnius. His grandson, Jogaila, upon becoming also King of Poland, extended the Gediminian dynasty (called Jagellonian in Poland) to that country, giving it what it has been described as Poland’s Golden Age. 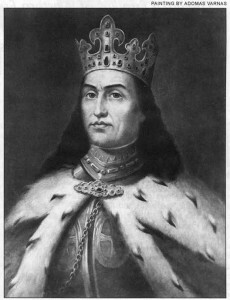 His grandson, Vytautas the Great, is regarded as the most important Lithuanian political and military leader of all time. Gediminas’ descendants scattered around the known world, and many of the noble families mentioned in this article claim him as their direct ancestor. Radvilas “The Black”, Governor of Vilnius and Chancellor of Lithuania; Jonas (John) Sapiega, Grand Marshal; Jonas (John) Karolis Katkevičius, Governor of Vilnius and Grand Marshal. The Radvilas family is perhaps the most colorful, and the one with the most repercussion in Lithuanian, Polish and European history. It is one of the oldest families of Lithuania, and its origin – as is the case with most old families in other countries – is shrouded in myths and legends. The family name itself, Radvilas, is a compound o f two Lithuanian words, “rado” (found) and “vilkas” (wolf), and ties in with a legend in which the first Radvilas, a baby, was found and nursed in a forest by a wolf. Spellings of the name in Latin (R a d iv ilo , R adivilio and R adivil), which appear in early historical sources, indicate its Lithuanian origin. The Polish version of the name, Radziwill, was created later. 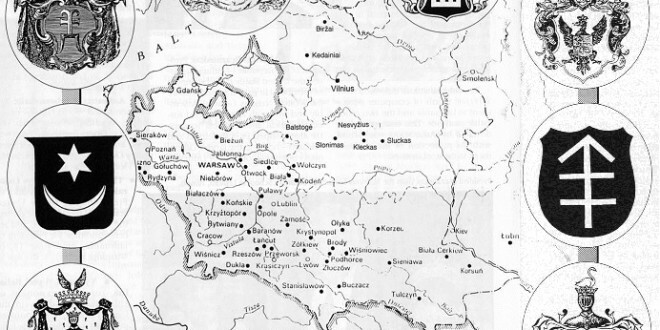 Of all the Lithuanian families, the Radvilas no doubt had the greatest influence in Lithuanian and Polish political, social, economic, cultural, military, and particularly religious events. Their wealth was beyond comprehension and many regarded them to be the true rulers of Lithuania. Their reputation and influence was such, that European kings and emperors would rather deal with the Radvilas than with the king himself. During the 16th century, the Radvilas were the most ardent supporters of Reformation in Lithuania, and under their initiative, Protestantism took hold among the predom inately Catholic higher nobility. The various branches of the family sp read out not only through Lithuania and Poland, but also to the rest of the world, including America. Some of its members became important political and military figures in Prussia, Germany, Russia, France and other countries. Others became schol ars, writers, artists. And of course, they eventually joined the world’s most famous modern families when Jacqueline Kennedy’s sister Lee Bouvier married Prince Stanislav Radziwill (Stanislovas Radvilas) in 1961. The Sapiega is another very old family with roots in the principality of Smolensk, which was under Lithuanian Rile for a number of years. This family competed with the Radvilas for power and prestige in Lithuania, and occupied the highest state, provincial and local position as well. One of its members, Benediktas, was often referred to as “King of Lithuania”. Another, Leonas, compiled the 3rd edition of the Lithuanian Statute, the most advance code of laws in Europe at the time. Petras was a famous military commander who routed the Russians and put siege to the Kremlin. The Sapiegas were also great supporters and promoters of the arts, sciences and education, as well as builders of beautiful structures. The Katkevicius family flourished during the 16th and 17th centuries. It provided some of Lithuania’s most famous military com m anders (h etm ans). Jo n a s fou ght the Turks, Russians and Swedes, and stopped their invasions into Lithuania. He put siege to the Kremlin, and defeated the entire Swedish army in one of history’s most famous battles, Salaspilis (Kirchholm). He also built the bastions, blockhouses and fortifications around Vilnius, which were of utmost importance to defend the capital city during Lithuania’s numerous wars with Russia and Sweden. Members of this family were also great builders of schools, hospitals and magnificent churches and p alaces. The Katkevicius palace in Vilnius has just being restored to its original splendor, and has been opened as the Art Museum of the City of Vilnius. The Pacas family dominated Lithuanian affairs throughout the entire 17th century. Its members also occupied the most important posts in the Grand Duchy. They were ardent promoters of the arts, and built some of the most beautiful churches in Lithuania. Kazimieras built S.S. Peter and Paul’s church in Vilnius, a masterpiece of Baroque architecture and sculpture, and Kristupas, the Pažaislis monastery near Kaunas, another architectural gem. Both structures still stand today, and are being admired by locals and visitors alike. Members of this family were also leaders in uprisings against Russian occupation during the 18th century. Some, such as Leonas, were on Napoleon s staff, and accompanied the French Emperor during his 1812 Russian Campaign. 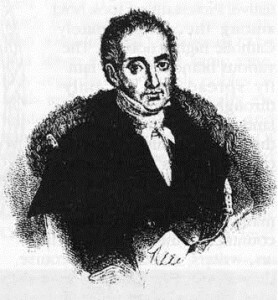 The Cartoriškis family, w hich claims direct descent from Gediminas, dominated the Lithuanian and Polish political and social scene throughout the 18th century. Same as the other families described here, occupied the most prestigious and important posts in Lithuania and Poland. 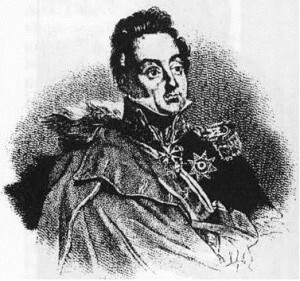 Some members were pretenders to the throne, and one, Stanislas Augustus Poniatowski, was actually elected as the last king of the Commonwealth. 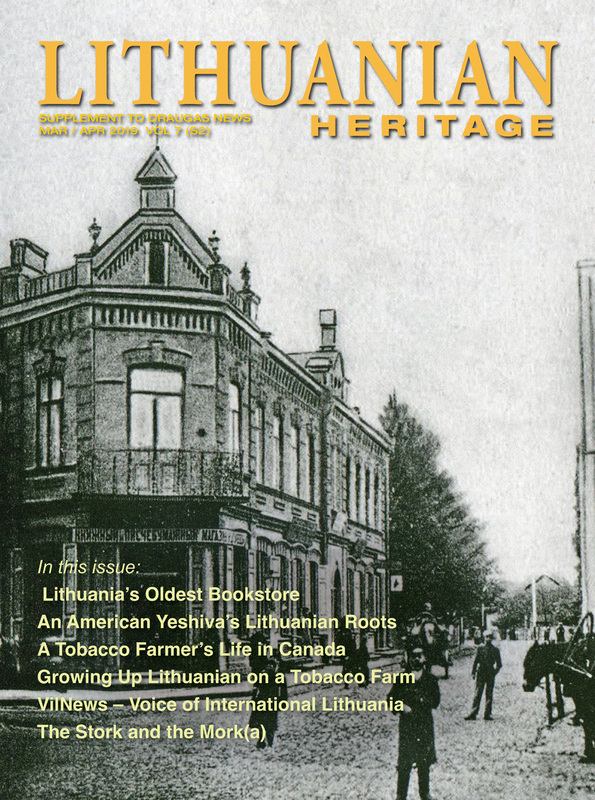 The contribution of this family to Lithuanian culture and education is noteworthy. Following the final partition of Lithuanian and Polish lands between Austria, Prussia and Russia in 1795, this family, which in the early years of the occupation supported Russian interests, reverted in support of the Lithuanian cause. For their patriotic activities, some of its members were persecuted, others exiled. Many lost their lands and property, and others were forced to flee abroad. They ended up in France, England, Germany and other countries, including the United States. 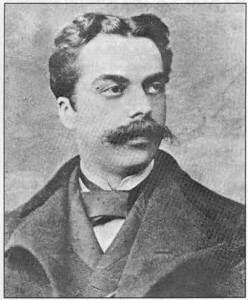 One of its most renown members, Adomas, moved to France, where he ardently continued to work against Russian oppression. The Oginskis family influenced Lithuanian and Polish affairs from the mid-17th through the 20th century. Its members were great supporters of the arts, particularly music, as well as education, sciences, and the development of commerce and industry in Lithuania. Some of its members were military commanders during uprisings against Russia in 1771 and 1794, and another, Gabrielius, commanded Napoleon’s 20-men honor guard throughout his entire Russian Campaign. During the 19th century, the Oginskis were great defenders of Lithuanian language and education. They were also protective of their subjects, who they released from serfdom in 1835, earlier than other magnates in Eastern Europe. In Lithuania they were the first to establish credit unions for their workers. They also built hospitals, orphanages, birthing houses, a school of agriculture, a canal. They are credited with bringing electricity and telephone to Lithuania. In addition to the great Lithuanian families described here, there were hundreds of others, which in one way or another, contributed to the fortunes and misfortunes of Lithuania throughout its long and turbulent history. Names such as the Ostrogiškis, Platens, Goštautas, Giedraitis, Sanguška, Manvydas, Kesgaila, Daugirdas, Kontautas, Mongirdaitis, Kiška, Chreptavicius, Valavicius, Tiškevicius, Gelgaudas and others, have all left their indelible mark on past events. Previous Did Adam and Eve Speak Lithuanian?